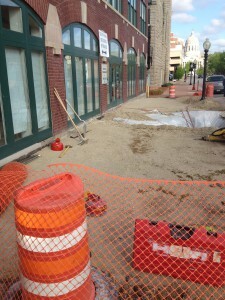 As our clients may have noticed, the construction process is still occurring for our new sidewalk. The front door of our building will be unavailable for use the week of April 20. However, we are still open for the same hours and business as usual. If you are planning on visiting our office, please use the side door found in the alley on the east side of the building. From there, signs will guide you to our reception area and temporary entrance. Thank you for your patience and support through this construction project. Below you can find a picture of what our temporary construction zone looks like.